Do you want to transform your outdoor living space or commercial property? You can do so by having VistaPro use brick pavers and inlays. VistaPro serves Annapolis and the surrounding region, adding elegant brick pavers and inlays to patios both large and small. Best of all, VistaPro works with clients every step of the process in order to ensure the project is meeting their needs and expectations. In other words, there are no surprises. 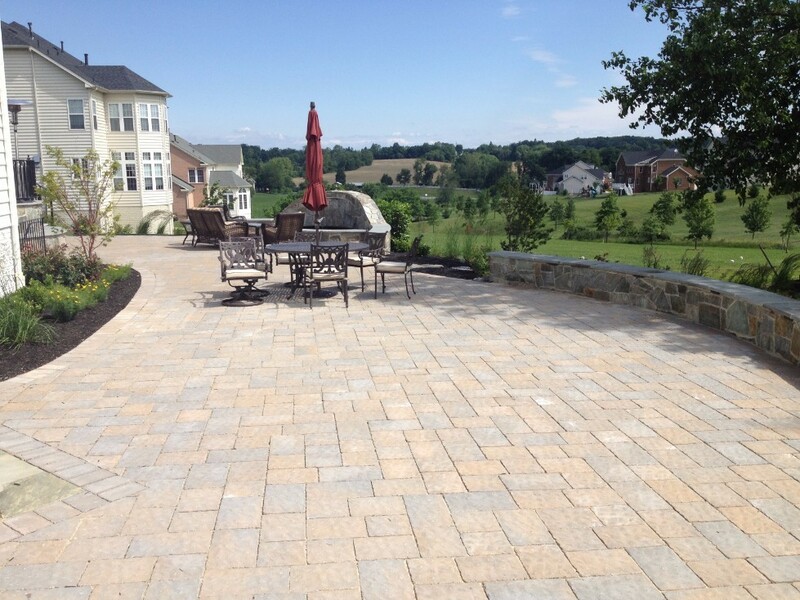 Do you have a vision for what you’d like the patio floor (aka “hardscape”) to look like? Thanks to brick pavers and inlays, VistaPro can make your vision a reality, bringing your dream space to life. But wait– maybe you’re wondering… what are “brick pavers and inlays?” Most people are familiar with walking on bricks underneath their feet. Brick pavers are the bricks that create the floor of whatever area you want– the patio floor, for example. Inlays are designs that break that monotonous brick up with special designs that stand out from the bricks around them. You could call this “interlocked paving,” which actually dates back to Roman times. Meanwhile, brick pavers are good for patios because they’re both durable and flexible. Pavers don’t crack and they can handle movement underneath them, so root growth, frost, erosion and even earthquakes don’t bother them much. Because brick pavers can allow water to drain through, they’re eco-friendly. And they’re versatile, too– choose from different textures and styles for the look you most prefer. What about repairs? If a paver gets broken or stained, here’s the good news– it’s easily removed and replaced. Unlike concrete/asphalt, where you’d get an awkward look making a little repair (unless you decide to replace the entire surface), brick pavers are kind of like Legos– take one out, replace it with another, and the whole thing still looks good. Plus, if someone needs to make underground repairs (to pipes/cables below the surface), a couple bricks can be temporarily removed to do so. People like VistaPro’s brick pavers and inlays because they resist deterioration from deicing salts, and their physical properties allow them to last quite a long time, continually looking good to all those who see and use them. With inlays, it’s a way of breaking up a monotonous look. So perhaps the bricks get placed going in an opposite direction where appropriate, or they’re colored in a certain way. Maybe you want your family’s crest represented? How about adding something fun, like a graphic or artistic-looking “thing” you like underfoot, such as a dolphin or flower? Inlays are kind of like tattoos for your patio. What kind of creative designs might you like to see underfoot? If you’re going to have to look at your patio, you might as well have it look the way you want it to. 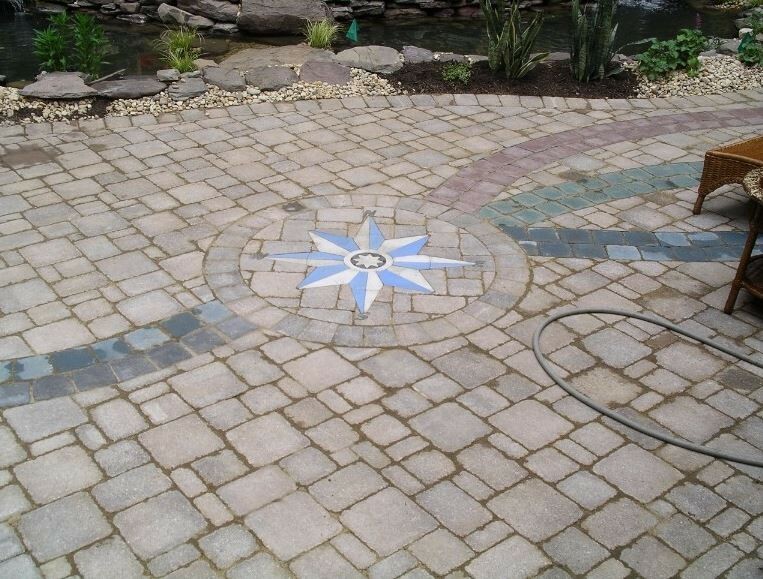 Therefore, request a free consultation with VistaPro to determine what your patio could look like with some work done. Much like you get a haircut or lose weight to change your overall look, things like brick pavers and inlays can help transform your patio space for a brand new, fresh look. Rather than have to deal with unsightly cracks that can happen with poured or stamped concrete, and instead of using blacktop which gets really hot and looks cheap, you should consider brick pavers and inlays for your patio. See some of VistaPro’s quality work here. Want to know more about bringing the charming look of brick pavers and interestingly-designed inlays to your property in Maryland or Virginia? 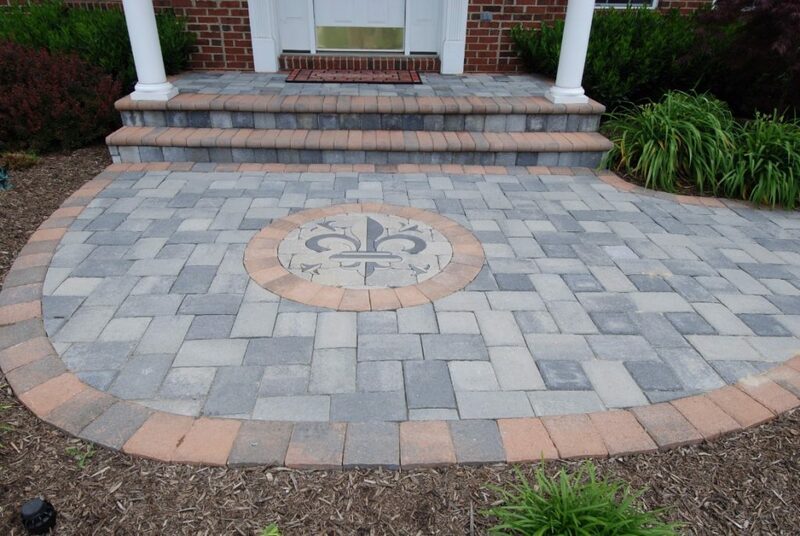 Please call VistaPro Landscape & Design today at 410-878-2100 in Annapolis or use the contact page.